in the entire history of the game. WFHC historical rating solution is an integration between scientific methodology and social values. The research methodology acts as a tool to standardize the criteria while social values has an essential role to define value of each performance aspect and function. WFHC represents the love of football historical value, having been identified as a semi-opened source of football historical innovation and has always been listening to the reader voice and a large number of the contributed comments led to further development. 1) To initiate and represent in research and development of all-time footballing evaluation. 2) To preserve the greatness of football history for the recognition of the next generations. 3) To generate the mutual exchange of useful information, data and idea between football historians and group of interested person to expand the extent of historical knowledge. 1) WFHC has been a non-profit body with spiritual contribution and centralization. 2) WFHC has been continuously improving and developing to increase its level of objectivity. 3) WFHC give importance to be a neutral workplace and pay attention in sustaining fairness of rating. 4) WFHC aim to lead the way of positive attitude and vision in football history discussion. 5) WFHC provides the service for readers in replying the inquiries and soonest responding to the suggestion/requisition in the best way. WFHC strives for being a sustainable football historical centralization within the chronological extension of the history. We always detect significant point of history and absorb into the system and inscribe on the pages. I appreciate all WFHC readers, participants, followers and supporters who has been recognized as an indispensable propulsion of the progressive project. I would like to requite supporters in my commitment to perpetually update and develop the football historical work. The frequency of updating players is every half of season and update club/national team ranking at the end of season or tournament. WFHC constitution is divided into Body and Branch. 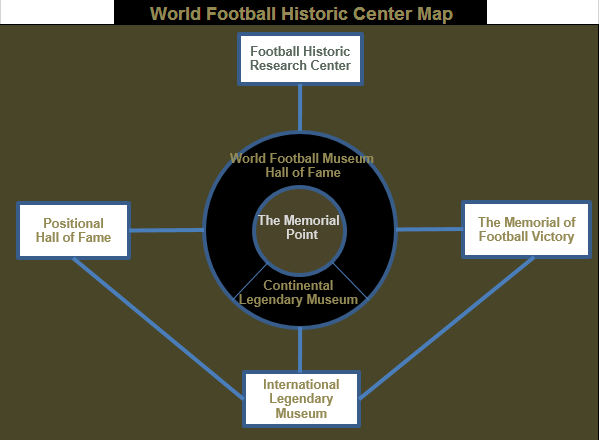 The central golden sphere is a world map on the ball represent the word “World Football Center”. The three orbit encircles the sphere represents the major three affiliated branches surrounding WFHC. 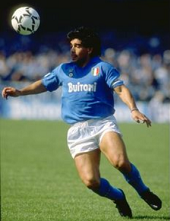 Although Napoli was unsuccessful in Series A, finishing 8th place and lost 7 matches, Maradona's average seasonal rating in this season is 7.03, one of the highest ever in history of Italian Series A. Maradona in this season is very fast, unstoppable dribbling, He scored 40 % of overall team goals with 4 penalty kicks. He made a hat-trick in 20th match against Lazio, is arguably one of the best matches in his domestic career. In match against Juventus, he get pass 5 Juventus players before being fouls in penalty box. Once he was fouled and lost balance fall to the ground but just a sec, he stand up very fast and continue running. He made a acrobatic style of passing with accurate overhead kicking. One of the incredible goals, he scored from corner-kick. In copa del rey, he scored 3 goals in 6 games when Napoli was eliminated at round of 16. 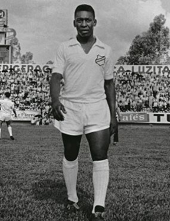 Pele played in 3 domestic competitions in 1961, Campeonato Paulista, Torneo Rio Sao Paolo and Campeonato Brasileiro. In total, he scored 55 goals in 33 games. From overall 10 hat-tricks, Pele made 8 hat-tricks in Campeonato Paulista, scored one hat-trick in Torneo Rio Sao-Paolo against Flamengo. In the campeonato brseileiro final match, he scored hat-trick against Bahia. The most extraordinary goal is the scene he drib pass 3 opponents and score decisively. Pele scored 48 % of overall team scores. Messi in this season won domestic double champion with Barcelona. is one of the most prolific scorers in history of the global domestic football with 48 goals (6 Penalty Kicks) and 22 assists or 1.6 (goal + assist per game). He scored 37.5 % of overall team goals and made 6 hat tricks. In attribute data, Dearman rates all of his 47 goals in La Liga and Copa Del Rey and give average qualitative scores as 6.7. 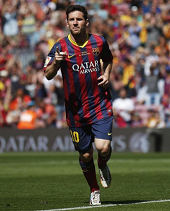 He obtains average seasonal rating at 7.82, the highest ratings in history of Spanish La Liga. Messi . He failed to score against Real Madrid in both home and away game. Messi withdraws himself deeper to attacking midfield and wing area and running across the deep-lying forward to penalty area to create many chances to his team or score by himself. Messi in this season is one of the most prolific scorers in history of the global domestic football with 53 goals (10 Penalty Kicks) and 18 assists or 1.61 (goal + assist per game). 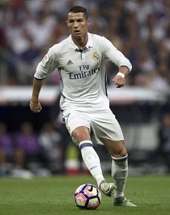 He scored 45 % of overall team goals and made 8 hat tricks in which is the highest hat-trick record in history of la liga. In attribute data, Dearman rates all of his 50 goals in La Liga and give average qualitative scores as 6.9. He obtains average seasonal rating at 7.72, one of the highest ratings. Messi established himself as a complete forward. His positional play in penalty box area to score had been developed allowing him to meet a ton of chances to score. He is also dangerous in his running with the ball in everywhere of the front line. However, he failed to score against Real Madrid in all 4 matches. Cruyff was achieving his peak performance with the leadership role of total football strategy. 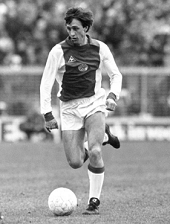 Cruyff appeared in every where on the midfield and front-line. He scored 26 goals in total 31 domestic games. He was named as man of the match against Feyernoord in away match with scoring 2 goals and 1 assist. In the home match, Cruyff did not produce any score and assist but he was reported to play very well throughout the game, participating in the first goal and almost score the third goal after dribbling pass a keeper but the ball was finally cleared out. In the dutch cup final, he scored one goal and made one assist with creating a chance for his teammate to score by penalty kick. In matches against top five side, he scored 5 goals and made 4 assists in total 9 games. 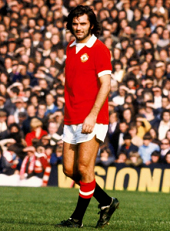 George Best in this season scored 28 goals as the top scorer of the league and received FWA footballer of the year awards. As watched samplings of highlight in match Man Utd versus and Liverpool, Everton and Arsenal, George Best is always dangerous and expectable in his dribbling that is unparalleled and help him to meet the chances to score by his own. Moreover, his shooting is 100 % accurate in direction. When he lost controlling the ball, his speed helps him to win the ball back at the moment. Zico scored 42 goals in total 45 domestic games or counted as 42 % of overall team goals. He led Flamengo to win Campeonato Barsileiro title. He obtained 8.16 rating in Bola De Ouro as the ninth place but the rating standard between positions saw very high variance. In attribute qualitative scoring rating, Dearman rate Zico in campeonato barsileiro at 6.8 in average. The best goal is the scene against Treze when he drib pass 5 players from the midfield area and finally scored by the chance of the overflowed ball. He also scored several goals by his heading thanks to his superb positional play and scored by free-kick only 2 goals. Quantitatively, Ronaldo scored 40 goals in 41 games counted as 38 % of total team goals. In attribute qualitative scoring rating, Dearman rate Ronaldo in La Liga at 6.8 in average. In the first half of the season, he scored most goals by awesome dribbling and his impeccable speed. The second half saw his decline in spectacular scoring style when he more scored by tapping and penalty kick. He did not play in Copa Del rey final which Barcelona win the title but his hat-trick against Atletico Madrid in semi-final second leg, is considered as a key performance of team achievement as a great come back after being led 0-3. At his only 20 years old, Maradona performed as the greatest young player ever, scoring 43 goals in 45 games in domestic football with Argentinos Juniors or around 50 % of total team goals. 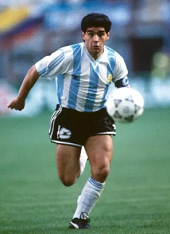 Maradona was a pivot of the team and he was used as a forward. He was a top scorer in Argentine Nacional and Metropolitano. Maradona in this season was very fast and remarkable in dribbling. Most of his goals were individually produced from his own actions. The average rating of his performance in 40 games is 7.10 is one of the highest ratings in history of Argentina Primera Division. 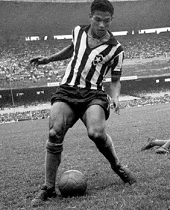 In 1962, Garrincha was named as the best player of Campeonato Carioca, Torneo Rio-Sao Paolo and Campeonato Brasileiro. He led Botafogo win the Carioca and Rio-Sao Paolo tournament and lost Santos in Campeonato Brasileiro final tie breaker 0 - 5. 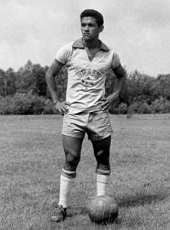 Garrincha was a confident one-man-show wih his phenomenon dribbling ability. The Carioca final match is one of his best games, he scored one goal after getting pass a defender and assist one goal from crossing. In total, Messi scored 15 Goals and made 3 Assists in total 15 Games. Messi was rated as man of the match in the final against Man Utd and most media rates him at 9 points. His spectacular goals against Real Madrid in semi-final second leg is regarded as one of the best goals in history when he drib pass 4 Real Madrid players before scoring the goal. In match against Arsenal, he scored an important goal just before the end of first half ิby flapping the ball across a keeper. In UEFA Super Cup, Messi made an incredible coincident assist aside from his scoring a goal. He is named as the man of the match in 2011 World Club Cup final against Santos. 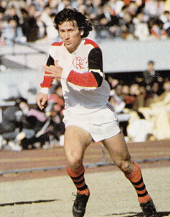 Zico scored 11 goals and made 4 assists in total 14 games. He was a phenomenon scorer in Copa Libertadores Cup final against Cobreloa, scoring all 4 goals that the team made. He scored a wonderful goal by perfect curving free-kick and the other two goals are made after his great positional support from midfield to penalty area. In semi-final match against Deportivo Cali, he scored the first goal after his superb first touch and scored the second goal by free-kick. He also scored hat-trick against Cerro Porteno in group stage. He did score in intercontinental cup but he participated in all 3 goals, making two assists and the second goal was achieved credit to his free-kick. Cristiano Ronaldo scored 13 Goals and made 6 Assist in 14 Games. He was rated by media at 9 points in four games against Atletico Madrid in semi-final that he made an hat-trick and Juventus in Final Match. 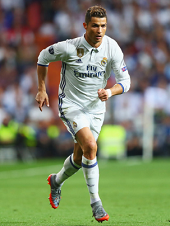 In match against Bayern Munich in quarter-final, he obtained 10 points in both leg and achieved hat-trick in the first leg. He did not play well in match against Napoli in first leg but he returned to perform superbly in second leg. In knock out phase, his average rating is 8.5. He did not player in 2017 super cup and receive only 7 point in World Club cup final. He scored only 2 goals in UEFA Champion League Group stage. Michel Platini scored 8 goals and made 4 assists in 11 Games. In attribute data, Dearman rates his average qualitative scoring point at 6.8. He scored 4 goals by penalty kicks. He made an incredible accurate long passing for the last two assists against Sparta Prague and Bordeaux. 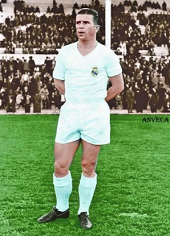 He played superbly in the European Cup final match which Dearman rate him as a man of the match at 8.5 point. In intercontinental cup, he scored a wonderful goal after bouncing the ball 3 tempos but it was mistakenly judged as offside by referee. 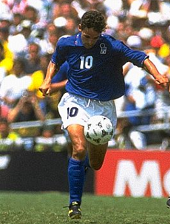 However, he made a 1-tempo quick passing to M.Laudrup. Cruyff scored 5 goals and made 5 assists from total 7 matches including 1972 European Super Cup that is held in 1973. Dearman rates him in man of the match against Bayern in European Cup quarter-final first leg. Pele scored 9 Goals in 6 Games. 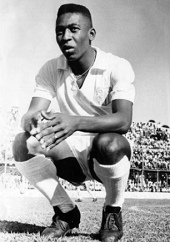 In Copa Libertadores cup, Pele played only a play off game of final game and scored all two goals. He scored other two goals against Cerro Porteno in group stage as Santos beat the opponent 9-1. 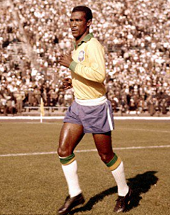 Pele's best performance came in 1962 intercontinental cup, scoring five goals and made an assist in two games, including hat-trick in the second leg. In related 7 goals in copa libertadores cup and intercontinental cup, dearman rates Pele's qualitative average scoring at 6.64. Pele scored 7 Goals in 5 Games. In Copa Libertadores cup, he only played in semi-final and final match as Santos qualified for semi-final round automatically. In intercontinental cup, he played only a game from total 3 and scored 2 goals. 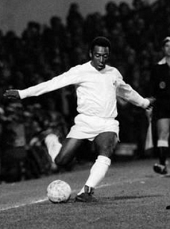 In Copa Liberadores Cup, Pele scored hat-trick against Botafogo in semi-final second leg. He also scored a winning goal in the final match. In attribute qualitative average data of Pele's related 6 goals, Dearman give 7.00 point. Van Basten scored 11 Goals in 12 games counted as 48 % of total team goal in this international club season. In attribute data, Dearman rates his qualitative goals at 6.8 points in average. 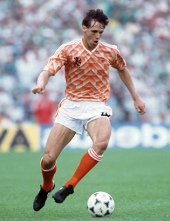 Van Basten scored 4 goals against Votoshua from Bulgaria at the first round. In the first leg of second round, he made one great assist Red Star Belgrade and he eventually scored a decisive goal in 3rd match. In total, he scored by heading 4 goals, Penalty 2 goals and by left foot 2 goals. However, he failed to score a goal aside from penalty kick in super cup and intercontinental cup. Puskas scored 14 goals in only 9 games. He scored two hat-trick, the first one against Jeunesse Esch and the second one against Frankfurt in European Cup final match. He also scored 2 goals in intercontinental cup. In total, he scored 44 % of total team goals. Cristiano Ronaldo scored 19 Goals and made 5 Assist in 13 Games, counted as 45 % of overall team goals. In knockout stage, he is rated by media at 9 points in four games against Schalke (2 matches), Bayern Munich and Dortmund. Unfortunately, he did not play well in the final where he received only 6 point the same rate as his performance in World Club Cup final. Also, he scored only an important goal in knock-out stage. His 17 goals in UEFA Champion League is the record of highest goalscorer in a single season. He scored two goals in super cup against Sevilla. He made one hat-trick at UEFA Champion League group stage against Galatasaraay in the first match. Maradona scored 5 Goals and made 4 assists in 7 Games. Maradona scored the best goal ever in history of the game against England in quarter-final match when he dribb pass 5 English players from the central midfield area to score. In match against Belgium in semi-final, he drib pass 3 Belgian players and scored another wonderful goal. Maradona made an assist in final match that is the only game arguably if he is deserved man of the match while he is considered as the man of the match in the previous 6 games conveniently. In Opta stats, he made 81.9 passing accuracy, 50 % shot accuracy, duels won 57 % chance creation 2,1 times per game. Garrincha scored 4 Goals and made 2 assists in 6 games. In Knockout stage, He is deserved as a man of the match in all 3 games including the final match. Garrincha was phenomenally quick in his footage and drib pass at least 2-3 players often. He is unexpectedly very good in heading and very effective in his left foot as well. In the group stage, he only an assist to Amarildo against. His best match is arguably the game against Chile in semi-final when he scored two goals and made an assist. Platini scored 9 Goals and made 2 Assists in only 5 games or scored 64 % of total team goals. 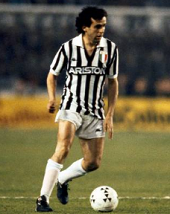 Platini is a main creator of the magic square, is excellent in coordination and synchronization from midfield to penalty area as well as contribute accurate passing consistently. He scored by free-kick two goals and he proved to be very good in aerial scoring with 2 goals by heading and a goal by penalty. Platini are conveniently deserved as the man of the match in 4 games from total 5. The only one match against Denmark could be shared with Alain Giresse. 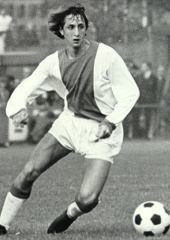 Johan Cruyff scored 3 goals and made 3 assists in 7 games. He was a central role in total football strategy, operating the game in everywhere on the midfield and the front-line and dominates in his speed and dribbling. His performance is rated in excellent level in two matches against Sweden and Argentina, is rated in very good level in 3 matches against Bulgaria, Uruguay and Brazil and is rated in fair level against East Germany and West Germany in final match although he made a magnificent scene and led to win penalty kick. In Opta stats, he made 81.3 % passing accuracy, 76.5 % shot accuracy, 56 % Duals won, chance creation 5.1 times per game. 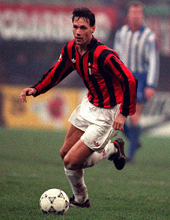 Van Basten scored 5 goals, 4 games. He scored many wonderful goals in this tournament including the most fantastic goal against Soviet Union in the final match when he made a spectacular volley from acute angle. In overall qualitative goal average rating, Dearman give him at 7.9 point. 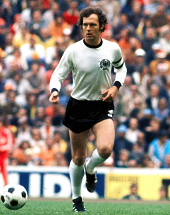 He scored hat-trick in match versus England and scored winning goal against West Germany. He is regarded as man of the match in all of these 3 games. Didi scored only one goal but made 6 assist. He was a main orchestra of Brazil with excellent ball controlling and consistently contributing accurate long passing with a drive curve trajectory. His performance is deserved to be rated as man of the match in final match against Sweden and semi-final against France, is considered as the best match in his career when he scored a goal and made 2 assists. 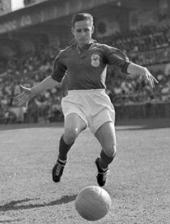 Kopa scored 3 Goals and made 9 Assists in only 6 Games as the record of highest assists in a single world cup tournament. He is a main creator of French game, playing as an inside forward position and is highly credit to support Just Fontaine's a record of goalscoring in history of world cup with 4 assists to him. In the group stage against Paraguay, he scored a goal and made 3 assists. 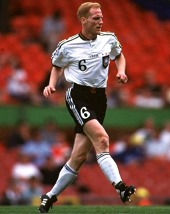 Sammer played in offensive libero role in 5-3-2 system. During the tournament, he performed superbly in going support from defensive line throughout the front-line with incredible synchronization with his teammates. He is also excellent in vision to pass from the back-line and performed sweeping effectively. He scored opening goal in match against Russia.He is named as Man of the match against Czech Republic in group stage and against Croatia in quarter-final, scoring a winning goal. Beckenbauer made an assist, 87.6 % passing accuracy, Duel won 64.4 %, tackle won 68.8 %, shooting accuracy 66.7 % and creates chances 9 times. He performs as an offensive libero as a director of team from the back-line with notable accurate long passing. 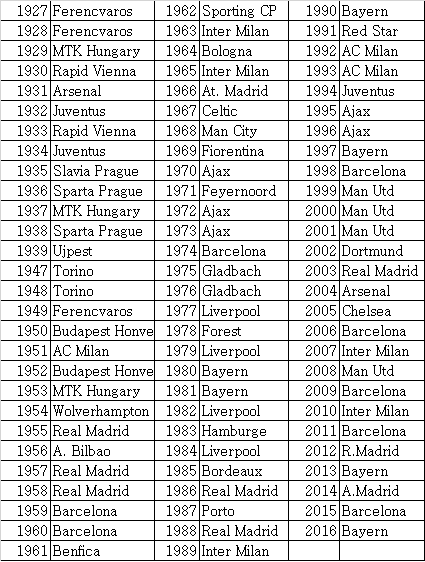 Throughout the World club football history, there was a chronological evolutionary change of competitions. The first professional football was formed in England 1892 while the amateur football was first ever established in South Americas a year later in Argentina but most of European and South American leagues turned professional in the 1930s. The limitations of football at the early era such as non-existence of international club competition, the irregularity of competition format and qualification, etc has left the complexity and difficulty for us to reach the status of each European club in its whole history. The world club team all-time rankingand The Worldwide historical club ranking based on mathematics [Marcelo, 2016) ranks the team based on titles criteria which is set the standard points of title acquisition between the leagues and the point given to any league are equally given between seasons. By this context, there is no proven source of standard point and not represents the actual fluctuation of the league/international cup standard from era to era. The evaluations were also not differentiated the performances to achieve the round or title. Accordingly, this work’s objective is to study, integrally regulate and standardize the system of the entire Latin American club history for the evaluation, including all performance characteristics (win-draw-lose, goal difference, place, round and trophy) against the determined standard of competitions within the designed system of methodology conformed to the existed format or condition at any point of evaluation. 1.1) Determine the winner of each annual continental competition by qualitative analysis. For the non-int-club era, the official friendly results are support to stipulate the value, if no enough record, performance of its national team are applied for consideration. Then, the performance will be adjusted +0.75 and x 0.85 to give positive value for negative raw data. Implement the same method as International club and the top level is determined from international club as well as the league competition. For tournament championship such as German Championship in pre-bundesliga era, it is implemented in the same concept as performance in knock-out tournament is used for identifying value of top level team. 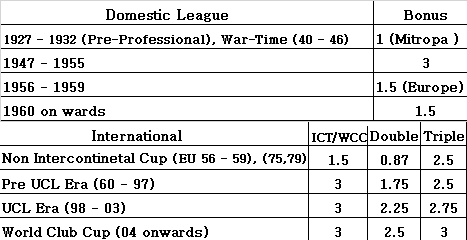 Basic Proportional Weight : Domestic League 52 %, Domestic Cup 16 %, Int. Club 32 % The performance is calculated in aggregate within a season not separated since the performance between competitions were a mutual dependent factors as football is purpose to mainly win the trophy not optimize the performance in any of competition level. As many of competitions are tournaments formats, it is implemented and calculated in aggregate mini-leagues method. For the season without domestic cup, basically the domestic league proportion is expanded to 60 % and increase more 16 % in non-international club era. Exceptionally the league proportion could be increased between 77 at minimum and 80 % at maximum by compensation from over number of participation (> 38 to 46 games per seasons). However, if the obtained performance is a negative value, it is not applied to the system and equal to Zero. That mean the lowest value to apply for the system has been standardized. The obtained seasonal performance will be matched to multiply with proportional weight of the best 92 seasons whose number is an average of available league seasons for the 50 qualified teams and calculated the sum to obtain aggregate total. The trophy bonus is designed in the following table. The league trophy bonus is given for only the club achieved the highest league point among national leagues in each season. The winners in the periods of 1927 - 1932 (pre-professional era) and 1940 - 1946 (war-time) are given bonus in less value than normal period. The domestic cup is not applied as a single bonus as the continental international cup has represented the teams in elimination format. However, it is applied for double and triple trophies if the club won International competitions and also won domestic cup. The International bonus is applied only to the winners of Intercontinental Cup/World Club Cup in its existed years. For the year without World competition, the winner of Europe and Latin American share the bonus by half of each. 0.2 % is required as a minimum value to unanimously decide the rank. If not, consider if the comparison couple has the other seasons than average, if so, compare its other best season by one. 0.1 is a minimum value to beat, if not, consider another season until match the rule. In case of no other season, the peak season is a decisive value with a minimum 0.1 to significantly differentiate. If not, recomparing in the second peak season or more if necessary. 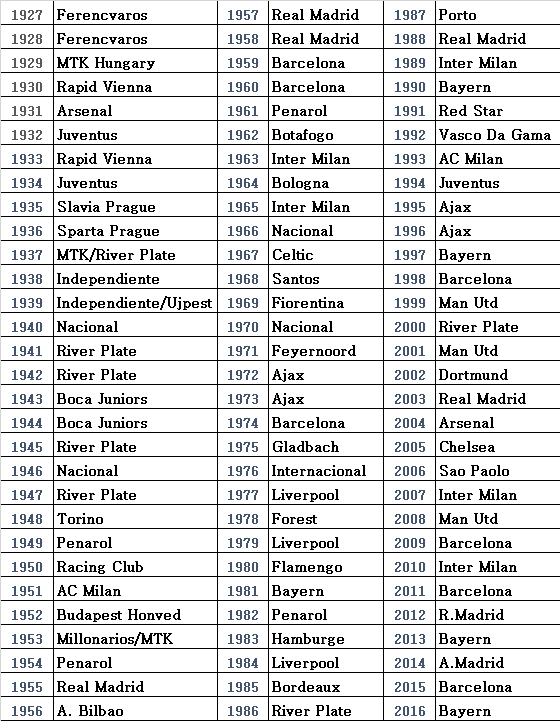 The best 50 clubs from European and South American lists are rearranged. Previously, 103 European and 51 Latin American clubs are selected for implementation by considering number of available seasons and the entire finished places. The implementation was done by excel formula database by manual input and correction checking. All related Latin American seasonal league tables are calculated for the club performance and standard of competition. All related cup competition games are count for the goal difference to determine competitive level. Finally, all performance and standards result are input the conclusive table. Each club are input the performance data in each part of competition and calculate for the aggregate seasonal point by competition-level proportional weight conformed to the actual condition at the time. The unavailable record : Paraguayan League (1906 – 1991). The Paraguayan clubs are ranked by international performance comparison against the estimative opportune factor of participation. Czechoslovakian Cup 1960 – 1970, Czech and Slovak Cup 1971 – 1980 ; Hungarian Cup 1934, 1935, 1941 – 1944, 1952, 1955, 1958, 1965 – 1968. For these related years, the competitive level is set by estimation. Ferencvaroc rating is effected little as there are the club result record. In the case of record unavailability, the case is equal to the unavailable competition that allows a higher portion of domestic league. The methodological implementation allows the rankings to have represented the clubs’ entire performances against the determined standard and greatness throughout the history. 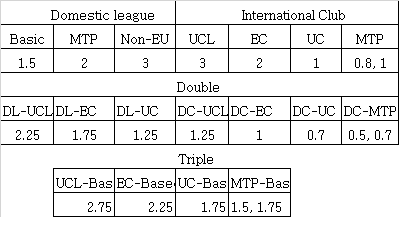 However, the qualitative analysis to determine top level performance of the best club in international competitions between seasons and eras are provided by author’s cumulative tacit knowledge converted to mathematics that is always debatable but the scale of tolerance is however quite narrowed, possibly effecting on the change of rankings in a minor part. Additionally, the proportional criteria between parts of evaluation and the proportional weight given to highest to lowest performance has a main role to finalize the ranking. The seasonal weight applied to the seasonal rating reduces the disadvantage of the teams that participated in lower seasons than average group in case of achieving a competitive high peak and the teams participated in more seasons than average group is just advantageous as they had more opportunities but the number of calculated seasons is still limited in average value. The result of implementation saw Real Madrid unsurprisingly ranked as a number one of the World. Barcelona achieves the highest peak by aggregate season. Penarol is the best Latin American representative and their only one appeared in top ten. 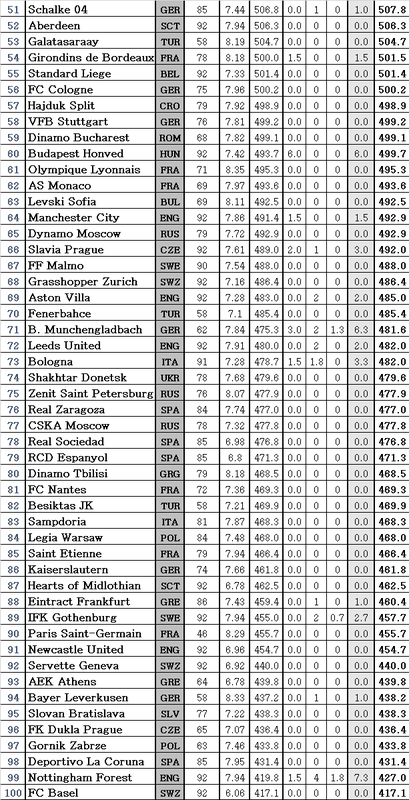 Estudientes and Ujpest are narrowly beaten by Feyenoord as the last 50th place. This site (WFHC) is a non-commercial website, is purpose for research and scholarship only.